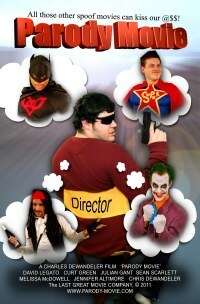 'Parody Movie' has just been released on DVD and is now available on Amazon.com. Hollywood, CA -- Los Angeles Film Director Charles Dewandeler returns to his roots in Detroit for the filming of 'Parody Movie' a feature length comedy. Filmed and cast in Detroit, the movie stars a host of newly discovered Michigan talent. Charles Dewandeler wrote the script after moving to Los Angeles. The story is loosely inspired by Dewandeler's own experiences in filmmaking, combined with his desire to pay homage to other comedy legends like Mel Brooks. It's no surprise that the characters in 'Parody Movie' spend a significant amount of time spoofing Superhero's like Batman and Superman. "I've spent so much time reading comic books and watching Superhero movies," says Dewandeler, "that when I make a film, I look at the story through a comic book lens." "Two Words: Genius" says Tom Santilli, The Detroit Movie Examiner. A film critic whose columns can be seen on Examiner.com and FilmSurvivor.com.